Our readers nominated their favorite subscription boxes, then voted on which of those boxes they loved most. 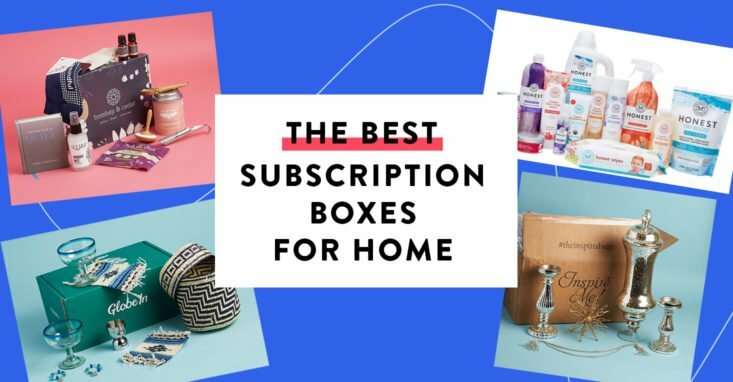 Here’s what they chose as the Best Subscription Boxes for Home! Do you love refreshing your space? Keep your house happy with help from these monthly subscription boxes for home decor and other household essentials! We asked our readers to name their favorite home picks in our 2018 Subscription Box Awards, and these 20 boxes topped the list. Whether you’re searching for unique barware, statement-making decor, home fragrances, small electronics, or even high-quality cleaning supplies, there’s a subscription box to suit your needs. Many of these boxes also make great housewarming gifts! The Cost: Varies; you’ll pick the items in this subscription and get discounts, so you can spend as much or as little as you want. Sign up here! The Products: Jessica Alba’s The Honest Company is the super popular source for premium, natural, and effective home essentials. With this subscription, you’ll get to pick as many products as you want, from laundry and cleaning products to shower goods and more. You can subscribe to a single product or as many as you want, and savings is based on how much you buy: Save 10% on orders $25+, 15% on orders $50+, and 25% on orders $100+. Check out all of our Honest Company reviews to learn more. The Cost: $40 per month + free shipping for the first month ($10 shipping for future months). Sign up here! The Products: Experience a new collection of ethically made, fair-trade home accessories and gifts with Globein’s beautifully curated subscription box! Each box contains artisan-made products related to a different monthly theme, plus a booklet of information about the people and companies behind each product. Check out all of our Globein Artisan Box reviews to learn more. The Cost: $49.95 per month + $6.95 US shipping, or save with longer subscriptions. Sign up here! COUPON: Use MSA10 to save 10% off for life on their recurring subscription box! The Products: This box is a treat for your home, your body, and your spirit! Each box comes with 2 essential oils and 6-7 full-size products such as home decor and fragrance items, plus skincare, books, healthy snacks, and other surprises with a retail value of $100+. Check out all of our Bombay & Cedar reviews to learn more. The Cost: $54.95 + $14.95 shipping to the US. Sign up here! The Products: This box comes packed with gifts, decor, and other household finds curated for different areas of your home. The items make great additions to your home, but they’d also make amazing gifts! Check out all of our Posh Home Box reviews to learn more. The Cost: $45 a month. Sign up here! The Products: Each month of Bespoke Post is curated around a monthly theme. From home goods (think barware, treats for coffee geeks, fragrances, and even electronics) to broader lifestyle items, this subscription box is always full of surprises– but you’re in total control and can choose which box you want every month, or skip altogether. Check out all of our Bespoke Post reviews to learn more. The Cost: $54.95/box (available monthly, bi-monthly, or quarterly) plus $10 flat rate shipping for most of the continental US. $15 to California. Sign up here! The Products: Third & Main brings the charm of small-town main street boutiques to your door. Each carefully curated box will include home and self-care items from “mission-minded” vendors right here in the US. Check out all of our Third & Main reviews to learn more. The Cost: Just pay a $2.99 shipping fee plus the cost of whatever items you buy! Or pay $19.99/year for a VIP membership (which includes gifts and price matching). Sign up here! COUPON: Gove Collaborative frequently has free gifts for new subscribers. Check out the latest offer here! The Products: Grove Collaborative handpicks the best in natural home supplies, including kitchen products, face and body, laundry, and oral care and makes sure you never run out! They’ll auto-replenish your favorite items each month—you can edit your shipments to make sure you’re getting the items you need most! The Cost: $159.00 per quarter for your first box (but save $ the longer you stay subscribed!). Sign up here! COUPON: Use coupon code MSA15 to save $15 off your first box! The Products: Breo Box delivers you a high-quality assortment of health, fitness, and everyday lifestyle essentials inside a handsome wooden box! Each quarter you’ll receive 6-9 essential products carefully curated to fit the season. You can expect games, organizational items, accessories, decor, and even electronics! Check out all of our Breo Box reviews to learn more. Ships to: Worldwide. Shipping costs vary. The Cost: $139 to the US, $169 to Canada (every other month). Sign up here! The Products: Every-other-month, Luxor Box curates 5-7 full-size, hand-picked home products with a total value of $250+. Expect a wide range of chic surprises, including high-end spa products, top-shelf beauty products, jewelry, apparel, home accessories, and unique treasures from around the world! Check out all of our Luxor Box reviews to learn more. 10. D.L. Box by D.L. & Co. The Cost: $84.15 per season (or $99 per box if you don’t want a subscription). Sign up here! The Products: D.L. & Co. is a candle company whose quarterly subscription box features a gorgeous assortment of home items in an elegant box. Expect a collection of candles, home fragrance, and other home goods in each beautifully packaged shipment. Check out all of our DL Box reviews to learn more. The Cost: Subscriptions start at $28.00 per month. (Shipping is $10.) Sign up here! The Products: Hygge (pronounced “hoo-gah”) is the Scandinavian concept of coziness. It’s about cherishing the simple things, from the feeling of a warm blanket to the company of good friends. This subscription sends you monthly goodies to inspire those hygge vibes, including a candle, a hot drink, and a “sweet indulgence”. Check out all of our Hygge Box reviews to learn more. The Cost: $10 a month. Sign up here! The Products: MightyFix from MightyNest helps you discover safe, healthy alternatives for home products you use every day. Each box includes one home essential that’s not only better for you and your family, but the environment, too! Check out all of our MightyFix reviews to learn more. Ships to: US (free for 48 continental states), Canada, and Australia (for an additional shipping cost). The Cost: $125 with a quarterly subscription, $120 a box with an annual subscription. Sign up here! The Products: Each season, Mostess sends subscribers curated, coordinated full-size home decor and hosting products all thoughtfully packaged in a beautiful box. Think cocktail ingredients, glassware tableware, linen, stationery, bar cart items, and more! Check out all of our Mostess Box reviews to learn more. The Cost: The Lucerna VellaBox is $10/month with $2 shipping; the Ignis VellaBox is $20/month with $2 shipping, and the Vivere Vellabox is $30/month with free shipping and handling. Sign up here! The Products: VellaBox is a subscription just for unique scented candles! The Lucerna box gets you one 4 oz. candle/month, the Ignis box gets you one 8 oz. candle/month, and the Vivere box which sends you 1-2 candles totaling about 12 oz./month. Check out all of our VellaBox reviews to learn more. The Cost: $56 per box (available in 3 or 6 month options). Sign up here! The Products: Nest Fragrances has curated its exquisite home products into a beautifully packaged monthly subscription box! Each month, you’ll receive a classic candle, a votive, a special surprise gift, and a note from founder Laura Slatkin on the month’s curated scent. Keep them for your own home or share these gift-ready items with someone you love! Check out all of our Next by Nest Fragrances reviews to learn more. The Cost: Choose from 3 different sizes of bouquets starting at $40.00. Subscribe to save up to 25%! Sign up here! The Products: These fresh flowers come from sustainable, eco-friendly farms and are are cut-to-order, which means no flowers go to waste. When you sign up, you can choose the style that fits your needs, and pick a frequency for receiving your bouquets (weekly, every two weeks, monthly, every two months, or every four months). You can always pause or change your subscription settings, and even include a note (if for instance, you’re sending your subscription flowers to a friend or loved one). Check out all of our The Bouqs reviews to learn more. The Cost: Subscriptions start at $29 per month. Sign up here! The Products: Heima means “at home” in Icelandic. Each month of this subscription, you’ll get a carefully curated selection of Nordic-inspired home and garden goods to fit your chosen style (minimalist, boho, or modern). Check out all of our The Heima Box reviews to learn more. That wraps up our list of the 20 best home subscription boxes! Did your favorite box make the list?